February is a month of many things, originally called Februarius by the Romans (from dies februatus or the days of purification). The early English called it ‘Solmonanth’ or literally mud month (not very romantic). It is also the only month in our modern calendar that changes (in length) depending on the year. Maybe it’s a fickle month. For many February is a month of special events; President’s day, American Heart Month, Valentine’s day and even National Margarita Day (which is February 22nd if you’re interested). Since everyone else will be focused on hearts and flowers how about a quick dish to go with that margarita. I used to live near the southwest border and in days of old we would travel to Guaymas Mexico, where we would buy shrimp by the kilo. I created this dish from my hazy memory (too many Margaritas). By the way sticking with the Roman days of purification, shrimp is a super food and really low calorie. Toss shrimp in the flour, set aside. Combine butter, tequila, and lime juice in saute pan, add jalapeno and cook for 2 minutes. Add garlic cook another minute, add shrimp. Cover and cook shrimp until pink. The sauce should be thick enough to stick to the shrimp. Use a bit more lime juice to thin as needed. To make the tacos use corn tortillas. I typically warm them either directly over a gas burner or on a hot cast iron pan with a bit of oil. (If you prefer flour shells go for it). 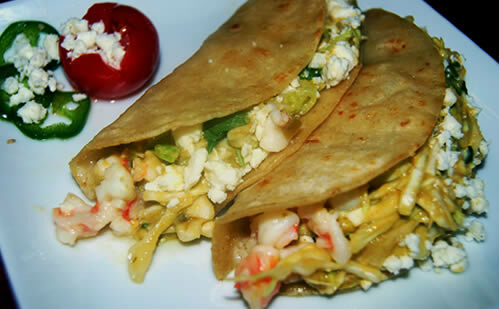 Place the cooked shrimp in the bottom of the shell and top with a mixture of the shredded cabbage tossed with mayo, fresh cilantro, lemon juice and avocado. Top each taco with a crumble of Queso Blanco. Slice a jalapeno very thin and layer on top to add some kick. Till next month, Make it Your Own!